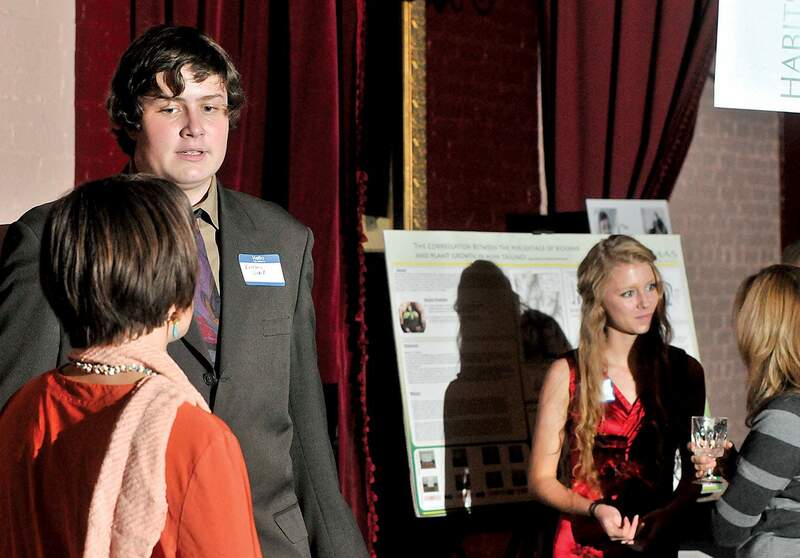 Animas High School senior Zachary Dowd took part in an internship with Spine Colorado during his junior year and talked about his experiences during the schools annual Friendraiser on Wednesday evening at the Strater Hotel. In back is fellow senior Aiyana Anderson. Dowd is the son of Robert and Hollie Dowd, and Anderson is the daughter of Mitch Anderson and Cindy Pitz. 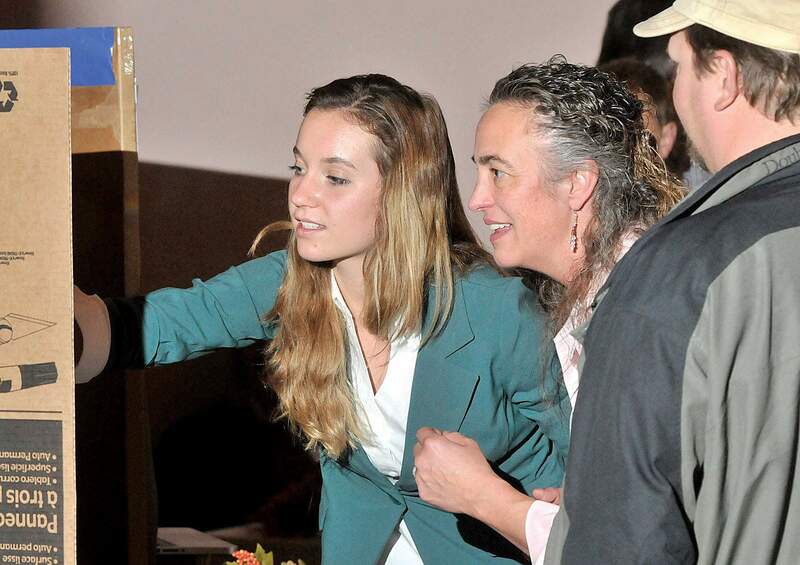 Animas High School sophomore Emily Wieser, left, daughter of Ross Weiser and Sharon Scott, shows her project about restoration of areas destroyed by megafires to Kelly Bachor during the schools annual Friendraiser at the Strater Hotel. The human mind is like a sponge, particularly when we are young. It is predisposed to soak up knowledge and master skills. We have learned a lot about different learning styles, and we understand much more about how to engage young people in learning in the last few decades, but its hard to execute in large schools, where teachers may be dealing with as many as 150 students a day. Ive gotten angry emails from teachers who perceive my great appreciation for what Animas High School, a public charter school, is accomplishing with its students through project-based learning, as a slam against teachers and schools in the various districts. Having taught briefly at Durango High School, I have the greatest respect for what happens every day in our schools. But I know firsthand how impossible it is to give every student the attention he or she needs and deserves. Or how much work it is to create lessons that challenge students who are racing ahead of the class while bringing along others who still need to learn the lesson. And how to take a textbook, which more often than not is pretty boring, and try to find a way to inspire students not only to learn the information, but to love doing it. What is happening at AHS illustrates how we, as a society, can create different methods of teaching that allow students to find the way that works for them, to create people who are not only lifelong learners  a critical ability in our rapidly changing world  but passionate, curious, committed lifelong learners. Its definitely an instance where smaller is better. Im curious to see if the Small Learning Communities at Durango High School will achieve the same kinds of results. On Wednesday, AHS held its annual Friendraiser, a combination exhibition of students work and a chance to raise money for the operating expenses of the school. The big challenge a charter school faces is paying rent for its facilities, while school districts own their buildings and pay for improvements via bond issues. So charter schools either take it from their per pupil revenue, meaning fewer dollars to put in the classroom, not an option for a rigorous college preparatory school, or raise the money, about $125,000 a year for AHS. The evening raised almost half of that, $61,000 in donations and pledges, thanks in large part to three generous donors who gave a $20,000 matching grant. Enough about the business, lets get to the inspirational part of the story. I lucked out and really had a chance to have a conversation with Lori Fisher, the 10th-grade humanities teacher. The sophomores are split into two groups of 30 students each, and she gets each group for two hours a day. That concentrated time alone makes a difference, but Fisher has learned a lot about working with students in this different kind of educational experience. The students spend quite a bit of time on poetry, studying everything from sonnets to beat poetry, before writing their own. Last year, Lacey Meeks video poem won a national award, and Fishers students have produced two poetry books, Speak Truth to Power and Weapons of the Wise, which are available on www.lulu.com. The big difference is that its not a race to cram in the material, and students spend three weeks just writing and revising their poems. Revising and editing are critical for good writing, and incredibly time-consuming for teachers. Emily Wieser, 15, the daughter of Ross Wieser and Sharon Scott, looked at ways of evaluating whether nature can take care of its own restoration after a megafire, the kind weve been seeing with increasing frequency in the West during the last decade, or whether it should be reseeded with native plants in the various biospheres and grass to keep the seed in and minimize erosion. Andy Lloyd, 15, the son of Leo and Susie Lloyd, brought his Rube Goldberg machine project from a year ago. A Rube Goldberg machine uses a complicated process to do a simple task. Andy and his friend Gordon Gianniny, the son of Fort Lewis College professors Gary Gianniny and Cynthia Dott, decided to make waffles, and it took them 26 steps, running into challenges such as having the batter holder pour long enough to fill the waffle iron and finding a way to slowly lower the irons lid so it didnt splash batter all over the kitchen. The point, Andy said, is that he did the project a year ago and still remembers the lessons he learned. Lyle Bryson, 15, the son of Phil and Lucy Bryson, and Corinne Truax, 13, the daughter of Bill and Maureen Truax, both brought their mask projects  the first task of incoming freshmen that takes them on a journey of self-discovery. Both learned to be truer to their own voices and resist peer pressure. Oh, and did I mention Shannon Etz, 16, the daughter of Ron and Linda Etz, who turned her geometry concept of interlocking two-dimensional items together to create a three-dimensional object into a cool modernistic bedside table? Or the cookbook her biology class created for people undergoing cancer treatment using ingredients with angiogenic properties to limit cancer cell growth? Called A Bite to Fight, its also for sale on lulu.com, and proceeds will go to help Teddy Rodd and his family as Teddy goes into his second round of fighting cancer. I talked to more students, all of whom blew me away, but my brainpower and my space are both hitting their limits. To learn more and support the school and its mission, visit www.animashighschool.com. You will leave feeling as jealous as I do. Enjoying short days and long nights for their birthdays are Will Siegrist, Carol Grenoble, Ann Casler, Sharon Harris, Maggie Scott, Judy Hook, Harry Goff, Jessica Hill, Daniel Latham, Sierra Lillard, Patrick McBrayer, Dale Warren, McKenzie Rion, Stacey Webb, Ivey Hermesman, Branden Marquez, Stacy Waterman, Sherry Wilmoth, Audrey Stockton, Sarah Von Tersch, Margie Winkelbauer, Marti Kiely, Bill Bishop and William Berger. Reg and Bev Graham are cuddling in front of a roaring fire for their anniversary.